Everyone has an opinion about World of Warcraft. Everything from “It’s complete garbage,” “Vanilla was better lol,” “Best game of all time!” and so on. 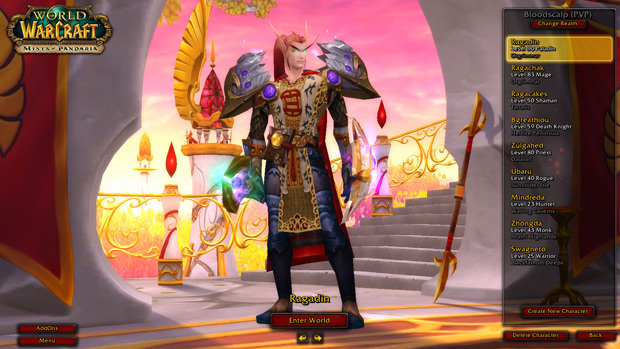 I am in a difficult position in that while I have played the game since the original “Vanilla” World of Warcraft (before the expansions), my personal thoughts will be broadcast throughout the internet, for good or for ill. I am not here to hoist Blizzard’s creation above all things, but there are good and bad things to be said for the game, and while it may not be for everyone, Blizzard has made a game that is for “most” people. While it is not the best MMO, or even my favorite of those on the current market (That spot belongs to Final Fantasy XIV, without question) it certainly holds a lot of fond memories for me. That is not to say that I wear nostalgia goggles while I play. There are lots of things that made the game incredibly frustrating for me, and no doubt, for other players. Unlike several of my close friends, I do not have a host of level 90s. I have an overwhelming tendency to get distracted, or disinterested with a playstyle, and try something else. I also have to take this time to thank Seamus McCarthy, and Courtney Jackson for providing the additional Alliance screenshots for me. Many thanks, you two! 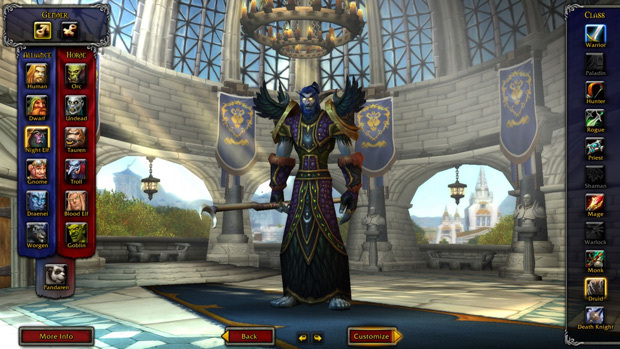 World of Warcraft is divided into two factions, which have their own unique races. The Alliance is made up of the Humans, Dwarves, Night Elves, and Gnomes originally. In the Burning Crusade, the Draenei showed up to aid the humans, and during the Cataclysm, the Worgen came forth. The Orcish Horde has the Orcs, Undead, Tauren, and Trolls. The Blood Elves and Goblins came forth at the same time that the Draenei and Worgen appeared. Lastly we have the Pandaren; they are a neutral race which only changes at the end of the zone where you pick a side to stand with. Personally, I was always a fan of the Horde. I prefer their version of the lore over the Alliance. I would rather strength and honor, over the vaunted justice of the Alliance. The classes themselves have changed constantly over the years the game has been played. The balancing has not always been fair or correct from my personal point of view, but it is there, and the staff at Blizzard do their best to keep it enjoyable for all. Originally, the Alliance had Warriors, Druids, Rogues, Mages, Priests, Warlocks, Hunters, and Paladins (Alliance-Only). The Horde had Warriors, Druids, Rogues, Mages, Priests, Warlocks, Hunters, and Shaman (Horde-Only). For balance purposes, the opposing faction were given the unique classes and later still we would see the Death Knight hero class, and Monks, which are available to both sides as well. 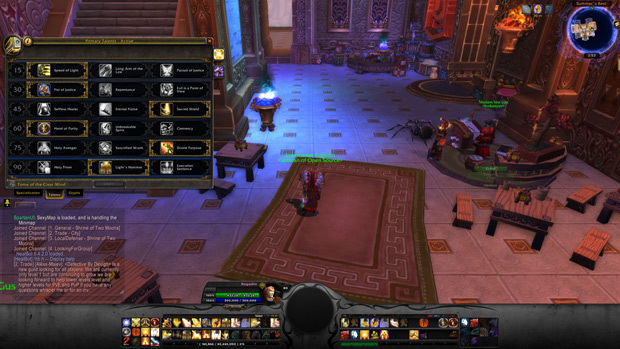 Each class has three sets of specializations, which vary from class to class. Each one has a purpose, from the myriad of damage types like Rogue and Warlock, to the all-purpose Druids and Paladins, who have a Tank, Healer, and DPS tree to assist in whichever position they are needed. Initially, there were three trees with dozens of talents that a player could take. They were specialized, in that Paladins would have Holy (healing), Protection (tanking), and Retribution (damage). These talent points could be spent in any tree, allowing a great deal of customization, but also a great deal of confusion could be garnered from this. As time progressed, the changes went to the talent system over and over, making it more and more general. Now the class talents are broad and generic, with the main abilities of the class being based on what specialization you choose. There was a time where you could take some of those abilities with some careful juggling, and have a vast array of skills and abilities. In the current iteration of the game, this has become standardized, even simplified. This is a rather unfortunate turn of events. One of the more interesting things about the talent system was the ability to do virtually anything. Now the class trees are more akin to bushes. Abilities are cut off based on what path you choose and I have not felt that many of the talent choices I made were particularly useful one way or another. There are choices that make or break a specialization but far and wide they do not make a lot of difference in the long run. The Repopulation reveals new lore: "Evening Star"
TERA Rising: Go Berserk Update Arrives July 7th - New updates to the berserker class, new dungeons and more!